Smurfs. They're the root of most issues in the game. Since today marks 2 years since that comment and reply were made on the wikia page, I wanted to bring attention to it again to ask if there will ever be fixes implemented for the exploits , like the level capping minmaxer smurfs were nerfed with the change made to the search engine. If not, why not ban the cheaters? Makes no sense that the guy using the node links exploit gets banned but the other worse cheaters don't. Smurfing would be harmless if it didn't give you the ability to exploit the hell out of the game. 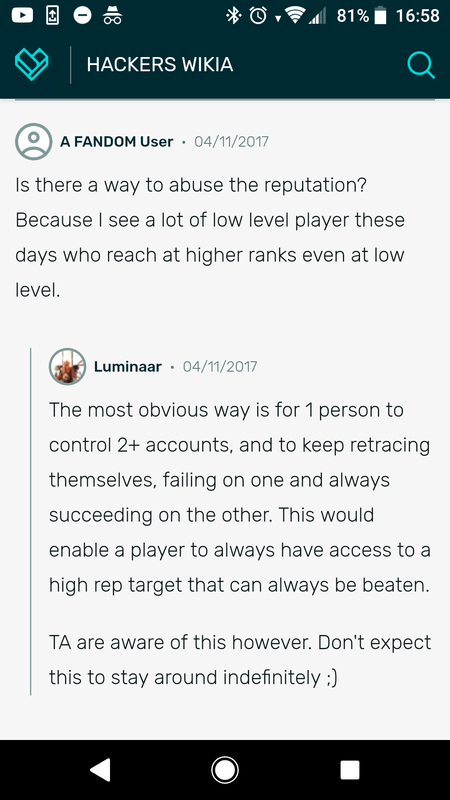 A player with 2 accounts (or more) linked to each other via retraces has an unfair advantage over other players. It's worse than the minmaxers cuz you can't just learn about distributing your XP efficiently and compete, you actually have to link up to another account and you become literally unhackable for 3 hours every time you reset your online shield. There's only a 1 second time window when you're vulnerable while resetting the shield so there's little that can be done to compete against such an exploit, except of course, fight fire with fire and do the same. The top of the leaderboards represents nothing more than the most active players and cheaters in the game. Change that, please.